Take a slice of the Earth’s surface and it might look a little like the tabletop sand tanks that a group of local high school students experimented with during a visit to Colorado School of Mines. Clean, clear water flowed through the model, the layers of sand, gravel and clay mimicking the properties of unconfined and confined aquifers. That was before the student scientists injected a “pollutant” into their aquifer systems. After, their job was to monitor the plumes of green dye growing, moving and changing before their eyes. 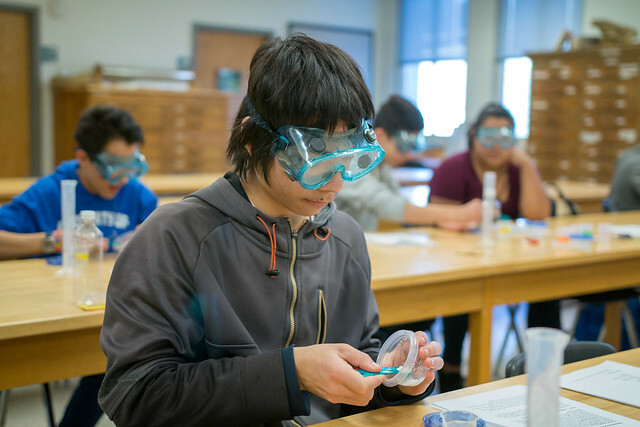 The hands-on introduction to the science of groundwater pollution was part of a day of interactive activities, tours and demonstrations intended to get students from underrepresented backgrounds in science and engineering thinking about the possibilities of college and STEM careers. The Integrated GroundWater Modeling Center, in collaboration with the Society of Hispanic Professional Engineers, welcomed 40 students from Alameda International Junior/Senior High School to campus for the March 14 event. While one group of students experimented with the sand tanks, others were monitoring simulated “earthquakes” with smartphones, participating in a scavenger hunt at the Mines Geology Museum and generating chemical reactions in systems both controlled and not controlled by biology. Lab tours and demonstrations built on the lessons learned during the hands-on activities. Among the research centers that students toured were the Earth Materials Institute, Center for Experimental Study of Subsurface Environmental Processes (CESEP) and Geo-Environmental Microbiology Lab. After lunch, students also got a tour of campus and learned a little more about what college is all about. “We hope that this event is something that we can build into a larger, longer-lasting relationship with Alameda, especially through our chapter of the Society of Hispanic Professional Engineers,” Singha said.